Hi! My name is Joi (Joy). I am a Latter-day Saint, a daughter of God, a wife, a mother and a grandmother. Of all the accomplishments in my life, being a mom is by far the greatest work I will ever do. The gospel of Jesus Christ and the teachings found within The Church of Jesus Christ of Latter-day Saints are the foundational guide for my role as wife, mom and "Nana." It is with and because of these teachings and my testimony in the Lord's Plan of Happiness that as hard as marriage and motherhood can be some days, I have no doubt that the work I do in my little corner of the kingdom is of eternal value. I’m going to take a little twist on the intensity of the subject matter I have been writing about so far to talk about how to have a lasting, happy marriage. Is that even remotely possible in our current divorce culture mindset? It seems like more and more, we just quit when it gets too hard and communication seems too difficult and never productive. This week I’ve been reading a book I wish I had discovered years ago in the early days of my marriage. 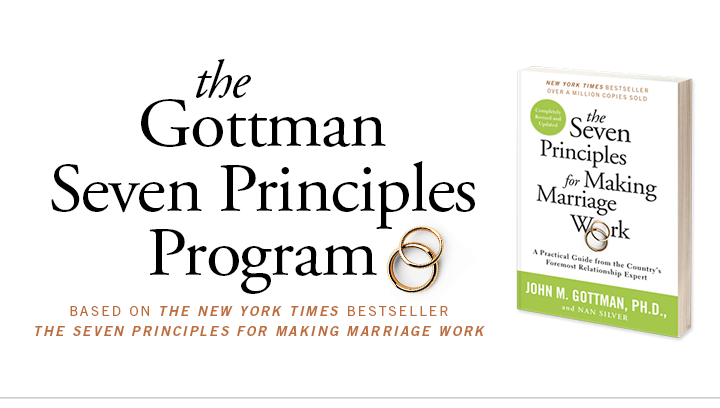 In this book, Dr. Gottman dispels the myths that have been prevalent in most marriage therapy practices and outlines a program to help heal even the most damaged marriages. He has a proven algorithm for predicting divorce. I’m only on chapter 3, but I can already highly recommend this book. If your marriage is struggling, or even if your marriage is relatively happy, this book can help. Take a look at this presentation to one of the most important concepts that has come out of Dr. Gottman’s research is his theory on “The Four Horseman”. Dr. Gottman refers to these behaviors as the most destructive and his biggest predictors of whether a marriage will end in divorce. How has the Four Horseman theory played out in your marriage ? Criticism: Statements said to your spouse that imply something is wrong with them. These statements typically begin with an absolute like, “You always” or “You never”. Defensiveness: An attempt to defend oneself from perceived attack by employing a counter complaint. Contempt: A statement or a nonverbal action that attempts to place you on a higher ground than your partner. Examples include; mocking, name calling, rolling your eyes or sneering. Disgust or contempt is known to be one of the most serious of the horsemen. Stonewalling: This behavior happens when the listener withdraws from the conversation, either physically leaving the room or emotionally tuning out and refusing to respond. It seems pretty incredible to think that just these 4 behaviors could be the root cause of marital discord and potential divorce. A marriage relationship is one of the most important relationship we will ever have. It is worth all the time and effort we put in to cultivating and caring for it. The promises and covenants we make to one another should not be taken lightly. What would you do to have a marriage that lasts? I Googled “how to have a happy marriage” to see what the trending advice was on the topic. Not surprisingly, I got everything from 7 tips to 60 tips on how to have a happy marriage. There are gender specific tips; tips for husbands or for wives. Even WebMD chimes in on the topic. A similarly quick search on lds.org lead me to the best advice: “Marriage, my beloved young brothers and sisters, should not be just taken for granted. It must be worked at, but realize that you can have the kind of marriage that you earnestly desire and for which you are willing to work” (Elder Henry D. Taylor, General Conference Oct. 1973). How hard will you work to have the marriage you want to have? Dr. Scott Braithwaite, A psychology professor at BYU in Provo shared some great advice on a Mormon Messages interview. It’s worth listening to (Listen for his reference to Dr. Gottman). In the Church of Jesus Christ of Latter-day Saints, the doctrine of marriage is an essential part of the Father’s great plan of happiness. In order for the children of God to progress, men and women need to enter into the sacred covenant of marriage. Both the man and the woman bring to the marriage relationship different, but equal contributions. The union of a man and a women establishes the divinely designed environment where children can be raised. If marriage has bearing on our eternal destiny then it cannot be initiated by a simple contract, easily dissolved. The agreement, must be made by covenant. As stated above, God fixes the terms for this agreement. There are many challenges in life that can weaken the fibers of a marriage. Money problems, raising troubled teens, the death of a child, job relocations, issues with extended family, all have the potential to take a toll, unless the couple is committed to one another and to the covenant they made with God. Any one of these problems in a contract marriage could send one or both parties in search of a divorce. Many think they can just get out of the marriage if things don’t go just the way they should. That attitude is the basis of a contract marriage. Easily begun easily ended. An eternal marriage is a sacred covenant not only for time, but for all eternity. It is not a contract that can be ended when one decides they are done. Covenants are binding commitments that require sacrifice and righteousness. In this world where the value of marriage, and even the definition of marriage continues to be corrupted, children need men and women; mothers and fathers who honor their marriage covenants. Men and women need a companion that will honor them by honoring their covenants. Think of the world we would have if more marriages were honored and remain in effect for the duration of a couple’s lives. Those marriage, bound by the sealing powers, have the potential to be eternal. For my own edification I put “Contract vs. Covenant Marriage” into a google search and found some very interesting blogs. Interestingly a couple of the ones that appealed most to me are not LDS. I am grateful to see other faiths embrace and teach the principle of a covenant marriage. For the most part we have a contract-oriented mindset about marriage that actually has the opposite benefit of what the term implies. I would love to hear your thoughts and see the posts on this topic that inspire you to have a covenant marriage. Should a court of appeals change the historically sound definition of marriage? Is it the right or the duty of a court of appeals to decide the future of a country’s marriage law? Can a small group of judges, forever adjust the anthropological pattern of the family to satisfy the few? Is it even in their stewardship to make such a far-reaching, impactful decision? Evidently, five judges believe that it is. This war on marriage is likely to be one of the longest battles humanity will ever see waged. It will be decades – generations – before the ramifications of the change in the definition of marriage are fully realized. Those who think they are being offended or injured now will be woefully unable to make restitution to those who are truth the victims – the children. The carnage of this war on family, on motherhood, fatherhood and on children’s development will be far reaching. As marriage is re-defined, so have they now re-defined parenthood and family. “Husband and wife have a solemn responsibility to love and care for each other and for their children. “Children are an heritage of the Lord” (Psalms 127:3). Parents have a sacred duty to rear their children in love and righteousness, to provide for their physical and spiritual needs, to teach them to love and serve one another, to observe the commandments of God and to be law-abiding citizens wherever they live. Husbands and wives—mothers and fathers—will be held accountable before God for the discharge of these obligations. The role of a mother and a father in the lives and development of children is crucial. Laws cannot change this or minimize or build myths around this truth. Mothers and fathers are not interchangeable. Having two adults in the home does not replace the importance of an active, participating mother and father. Children are entitled to birth within the bonds of matrimony. Children are entitled to be reared by a father and a mother. To re-quote Justice Roberts, Marriage “arose …to meet a vital need: ensuring that children are conceived by a mother and father committed to raising them in the stable conditions of a lifelong relationship.” Marriage is also in place, because it is ordained of God. Families are a crucial unit not only of this society and of heavenly societies. Family is eternal in nature. To toss out our or re-structure it because 5 judges have allowed it, it wrong. We need to recommit ourselves to our children. With more than 40% of children born outside of marriage, with courts deciding what marriage is, or what parents can now be – we are failing our own children. I’ll wrap this up by sharing a link to Cathy Ruse ‘s video. She raises some excellent points that are worth considering. In another class I took at BYU-Idaho, I was assigned to read an article entitled, “How We Lost the Plot” by Elder Bruce C. Hafen. In this article he addresses several of the whys marriage has declined as a valuable entity of our society. I remember saying in my mind, “Yes! that’s it”! as Elder Hafen outlined some of the causes. Issues like no-fault divorces and individual rights movements were discussed. Elder Hafen was addressing an LDS audience, with like-minded beliefs in marriage values. His purpose was clear. He did not mince words. On a blog, such as this, one attempts to be cautious not to rock the boat of social media in an effort to keep contention to a minimum. The topics I am assigned to address are not popular ones. In the years since Elder Hafen’s article, traditional marriage has declined even further in attitudes and doubt about the value of marriage. It is my mission and purpose here on this blog to discuss why marriage is important. I will discuss issues that are not always popular. Most importantly, my purpose is to share my beliefs and my witness of the importance of marriage. I will also be writing from my LDS point of view. My views and opinions will align with the doctrines and teachings of The Church of Jesus Christ of Latter-day Saints. It is my position that marriage is an ordinance established by God for the union of a man and a woman. Period! While we may think we can adjust laws and long established values to suit our current societal trends, there will be a cost for doing so. – Spencer W. Kimball, Ensign, Nov. 1980, 4. It is my belief that we live now in the time President Kimball then foretold. Evil swirls around us. Families and marriages are being destroyed and re-defined in countless ways. It is my hope and prayer to stand as a voice of warning, issuing a call to arms, if you will, to defend marriage and the family as God has ordained. A Deseret News version of “How We Lost the Plot” can be accessed here. Marriage: A socially acknowledged union or legal contract between two people, establishing certain rights and obligations between them and for children,in-laws and society in general. It is my position that marriage, as outlined above (between a man and a woman) matters, not just to me, but to people every where. Strong societies depend on the continuation of strong marriage laws and values. To start off this discussion, I’d like to share a link to an address by LDS Apostle, Elder L. Tom Perry, given in April 2015. His message, like mine, is that marriage matters everywhere in the world.